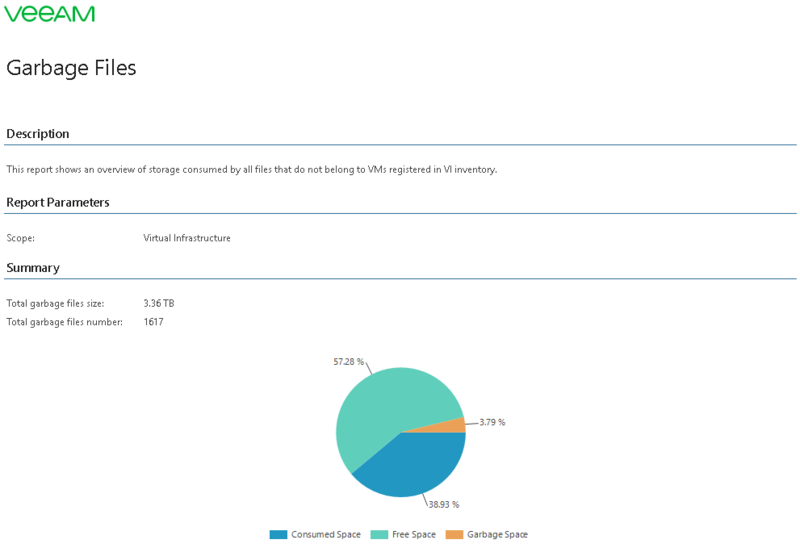 This report shows an overview of storage consumed by files that do not belong to VMs comprised in the infrastructure inventory. The Summary chart displays total amount of free space, amount of space consumed by non-garbage files and amount of space consumed by garbage files on datastores from the selected scope (in percentage). The Details table shows the full list of datastores with folders that contain garbage files. Click a folder name in the Details table to drill down to the list of garbage files in the folder. If a VM was improperly deleted or relocated, or if a snapshot operation failed, some residual elements belonging to the VM may remain on the datastore. This report allows you to check your infrastructure for garbage files that waste storage space and impact ROI. Business View objects: defines Business View groups to analyze in the report. The parameter options are limited to objects of the “Storage” type.